The annual Poole Lifeboat Sprats Supper hosted at Lilliput Sailing Club was almost washed out with no fishes on the dishes when a power cut put out the lights at the crucial moment when the chefs were about to start cooking. You are not herring rumours. It reel-y was almost a case of no fishes on the dishes at the Poole Lifeboat Sprats Supper hosted at Lilliput Sailing Club on 5 January. A power cut took out the electricity when the chefs were about to start cooking 50 kilos of sprats for over 60 hungry guests. In the half-light the banter went off the scale. The bar fortunately wasn’t a fishue, as didn’t require any electricity to run and a novelty ‘candlelit raffle’ added to the ambience. The time went swimmingly and the power was restored an hour or so later when the chefs got to work and the sprats were served. 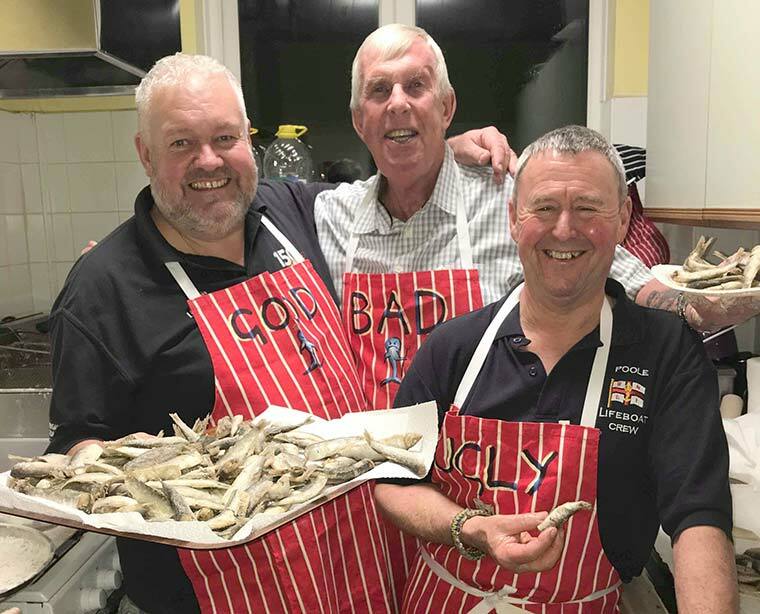 One of the chefs, Poole lifeboat volunteer Jonathan Clark, explained that the sprats supper is a long-standing tradition going back to the days when the lifeboat station was based at Salterns. “It is important for us to continue the tradition,” he said. “Lilliput Sailing Club warmly welcome the crew. It’s always a good night, to meet up, yarn and eat together and we also raise some money for the station. The other chefs were ex-crew Mikey Hallard and recently retired LOM Rod Brown. All did brill-iantly.